There’s nothing like a multi-pet home. There are, however, a few challenges to be expected along the way. You see, even though cats have the instinct to fear dogs, both pets certainly can learn how to play nice, or at least coexist peacefully. First, you need to understand that cats are different than dogs. For one, they’re a bit distant, and it takes them time to get used to new places. Dogs, on the other hand, are social, territorial animals. Your energetic dog might get overly excited about the new kitten, which can make things extra stressful, especially at first. Luckily for everyone involved, there are simple actions you can take to avoid it. 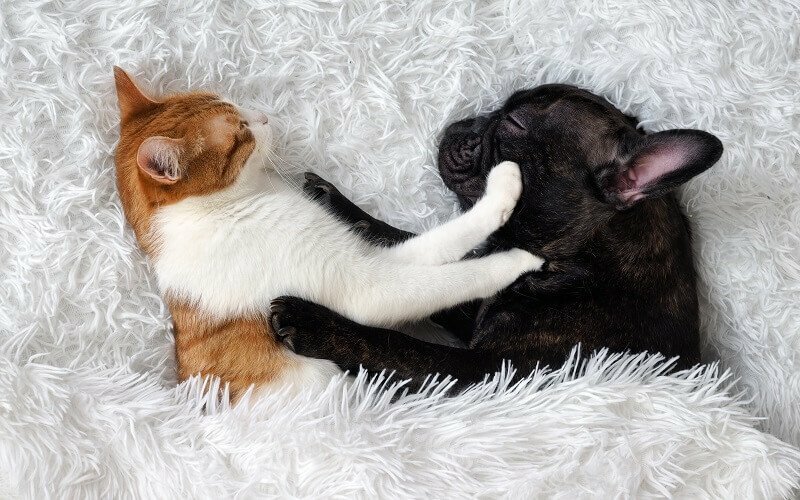 In this post, you’ll learn you how to introduce a hyper dog to a kitten in just a few easy-to-follow steps. Even if you don’t know much about cats. This is a very important step and something you should do with your dog whether or not you bring home a pet. Hyperactive dogs are naturally curious, and for the most part, their intention is to play. But depending on your dog size, even that can be dangerous. Just to be cautious, you shouldn’t leave the kitten and your dog unsupervised, at least not until the cat is old enough to take care of herself. Teach your dog basic commands before you decide to bring a kitten home, because if you don’t have your dog under control, he may jump, scare or even hurt her. Use positive reinforcement when you train your dog, or learn how to use an electric collar correctly. Also, dogs that are spayed/neutered, will probably be less aggressive and less territorial with other animals. If your dog’s breed has a tendency to be aggressive or is bred for hunting, you may need to consider whether it’s really safe to bring a kitten home. Each dog is different, and you know your dog best, so keep this in mind. As opposed to an adult cat, it’s easier to introduce a kitten to a hyper dog, or any dog, since she won’t have any inhibitions or negative past experiences. If you can, pick the one that you find most courageous. That way, she will probably won’t run from your dog and reward his chase instinct. You should introduce your dog to a kitten once she’s around five to seven weeks old because if she doesn’t interact with a dog or other pet at a younger age, she might develop fear towards larger animals. Also, check if the kitten has already socialized with dogs before, as this could make the introduction a lot easier. When your dog is tired, he’s calmer and doesn’t have a build-up of energy, so it’s less likely that he will nag or chase the kitten out of boredom. Remember to socialize your dog only when he’s relaxed, and make sure to reward him if everything goes well. In the first few weeks after you bring the cat home, take your dog out for long walks or other high-intensity activities to deplete his energy levels. This way, by the time your dog gets home, he will be ready to relax. Teaching your dog obedience also counts as exercise because he’s forced to use his brain and follow instructions, which will tire him out even more. Dog toys are also a great way to make sure your dog is occupied with something other than the new kitten. Find a room that your dog doesn’t sleep in, and make it the kitten’s safe space. 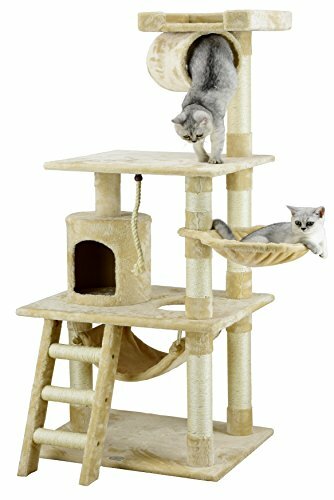 Consider getting a tall cat tree, such as the Go Pet Club Cat Tree (Amazon), to give her something to scratch on, as well as a high place to hide in if needed. The great thing about having separate rooms, aside from giving the kitten privacy and keeping her food and toys separated, is that you have time to calm and comfort your dog while the cat is in the other room. Also, your dog should stay out of the litter box. Not only should the kitten feel comfortable doing her business, but some dogs may feast on cat poop, which can get them sick. Before you think about introducing a hyper dog and a kitten in person, give one of your dog’s toys or blankets to the kitten. At the same time, take something that the kitten has played with or slept on and give it to your dog. That way, once they meet, they won’t be as curious and nervous, as they’ll already know one another’s scent. Feeding your dog and the kitten on opposite sides of the same door is a great way for them to get used to each other smells as well. But notice how your dog reacts to the cat smell. If he shows aggression, you need to take things slowly. If your dog seems to be only slightly interested in the scent, that’s usually a good sign. Pick a place that’s free of distractions so that everyone can focus. Then, ask someone to hold your dog while you’re keeping the kitten close to your chest. It’s important that you don’t hold the cat over your dog’s head as this might give him the impression that it’s a toy. Let them see and smell one another. If all goes well, make sure to praise your dog to let him know he’s on the right track. If you’re alone and your dog is trying to jump on the kitten, block him with your knee to make it clear that she belongs to you, and isn’t one of his toys. If both sides are calm, let them be on the floor together for a few minutes. Then, put them back in their separate rooms and repeat the whole process for a few days. Each day, gradually increase the amount of time your pets spend together. I should mention that I don’t recommend using a leash on your dog in order to limit contact with the kitten, because if you have to pull hard, your dog might get aggressive. If you have to use a leash, try to keep it loose and don’t restrain your dog unless it’s necessary. You can also use a pet crate to keep your pets face to face but with a barrier. You can also let the kitten out while your dog is confined inside his crate. Just don’t put her in the crate while your dog is out and sniffing around, as it might scare her. This is another safe way for the kitten to test the water. But you need to find a gate that has an additional small door for her to pass through while leaving your dog on the other side. That way, the cat has full control over whether she’s in or out. 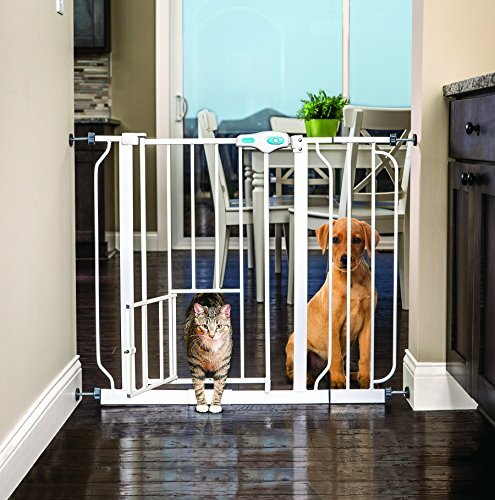 The Carlson Pet Gate (Amazon) is a great option for those who prefer not to drill holes in the walls. However, if your dog is a jumper, there are better options. Keep in mind though that you might need to keep the gate up for a few months until your pets are fully comfortable with each other. If the kitten is hissing at your dog or trying to run away from him, then she’s probably not ready yet to face him, and you’ll need to continue with the training. In case your dog is barking or whining at the new kitten, try redirecting his attention with a chew treat. In time, and with your effort, your two pets are sure to find a way to get along. I hope this helped you to better understand how to introduce a hyper dog to a kitten. Please take a moment to rate this post and leave us a comment if you have any questions.